It's Cinco De Mayo Day (May 5) in the states. In Japan, it's Children's Day (changed from Boy's Day in 1948). 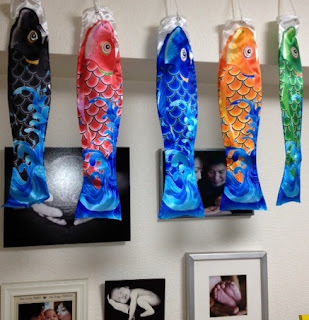 We celebrate it at our house by putting up koinobori (carp streamers). Carp are considered the most spirited of fish and because of its strength and determination to overcome all obstacles, it became the symbol of hope for boys to succeed in life. We also eat kashiwa-mochi, which is a rice cake stuffed with sweet red bean paste and wrapped in an oak leaf. The oak tree is considered sacred, and because old leaves do not fall off until new buds appear, they are a symbol of a continuous family line. 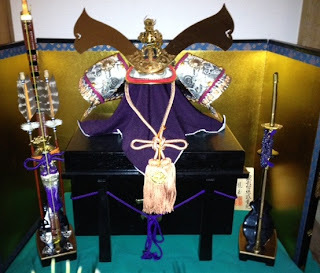 We also display the samurai dolls in armor. Since ancient times, the armor, helmet and sword of gogatsu-ningyo have symbolized the hope of physically protecting boys. 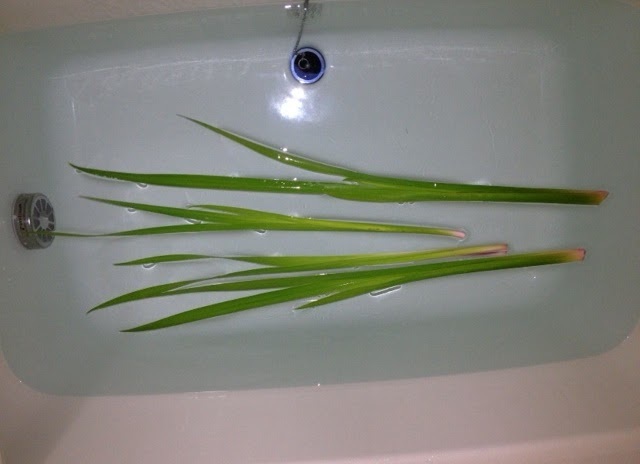 The day ends by putting shobu, the Japanese iris that somewhat resembles a sword in shape, into the hot-bath. The word shobu, although written with different characters, implies striving for success. Shobu-yu is also said to have a medical effect. It was believed to purge human bodies of noxious vapors. 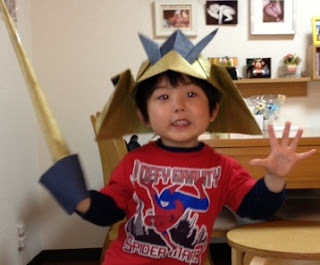 Taiga wearing kabuto (samurai hat) that mommy made. The event of Japan is exiting! I have never entered the Shoubu-You.I was surprised! I have never entered the Shoubu-Yu. Your son likes a samurai! your son is very cute and good looking! I think more, and wanted to let you know the Japanese culture by all means. An armour becomes your son! I have NOT known that the boy's day was children's day. The last picture is very nice. Your son looks very enjoyed it. 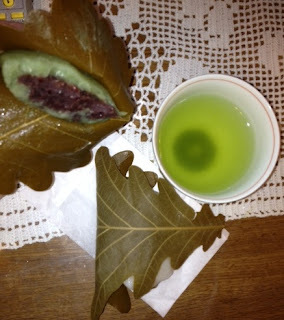 And also hand-made kabuto is so nice. I am 3bpe2128 Yoshiyuki Yazawa of Tokai university. It is novel to put a carp streamer in the house. New information for me !!! good to know more about Japanese culture. Taiga will grow up and be a Samurai one day. How to Teach English in Japan: "All about living and teaching in Japan."